I've only had this for like 15 minutes but I had to come write a review. This thing is seriously so much better than the built-in console. It's worth $25 just for the "source code" view that lets you see two lines above and two lines below the line of code where the trace was called. Then when you add the filter ability, export entire log, timestamp, etc. this thing is awesome. I'd seriously sell it for $50. This will save me more than enough time to justify the money. Edit: I'm back for more. My favorite part is actually the custom searches you can setup. 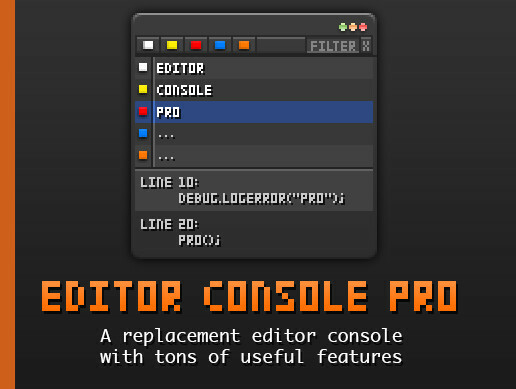 Editor Console Pro is a powerful replacement for Unity's editor console. Part of the 2017 Unity Mobile Essentials Pack! 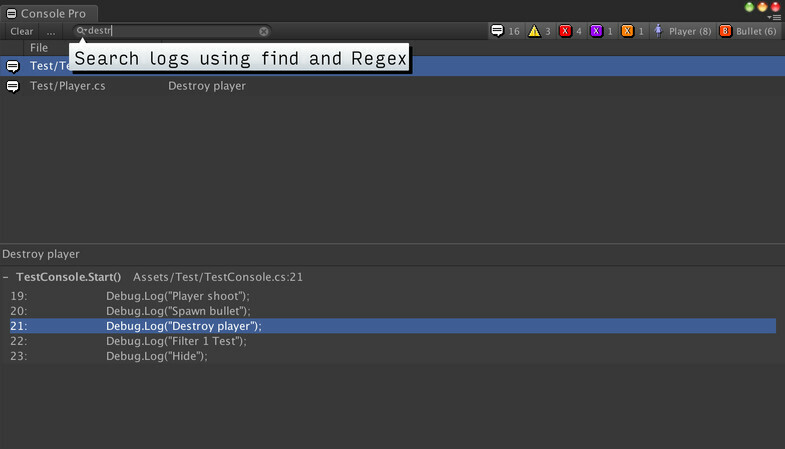 - Use a search field to filter all entries by text, file name, class, GameObject name on the fly. - Search and filter using Regular Expressions. - Create custom filter groups with their own colors, icons, and toggle buttons, instead of just the default Logs, Warnings, and Errors. - See the source code surrounding each method call in the stack, allowing you to see and jump to the code around the log. - Open your code editor to any method or line in a log's stack by clicking on it, rather than just to the Debug.Log call. 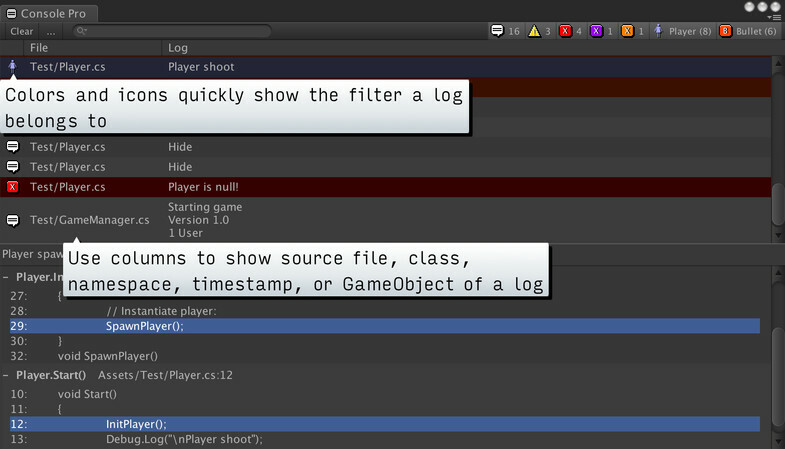 - Easily see a log entry's file name, namespace, GameObject name, and class in columns. - Ignore logs you never want to see again. - Ignore custom Debug.Log classes in the stack, so double clicking never takes you to the wrong code. - Watch variables without spam using special logs that collapse even though they have different content. - Use remote logging to get logs and stacktraces off of a standalone build or a phone/tablet build. 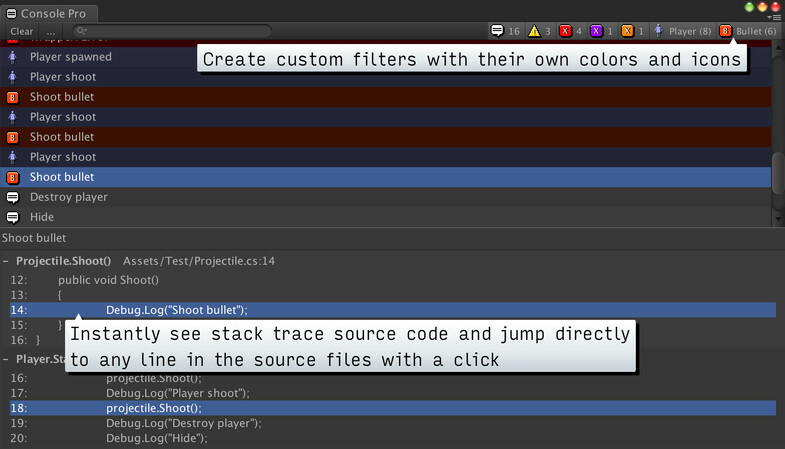 - Colorize the entire log line so you can quickly see different log types. - Use custom fonts and colors. 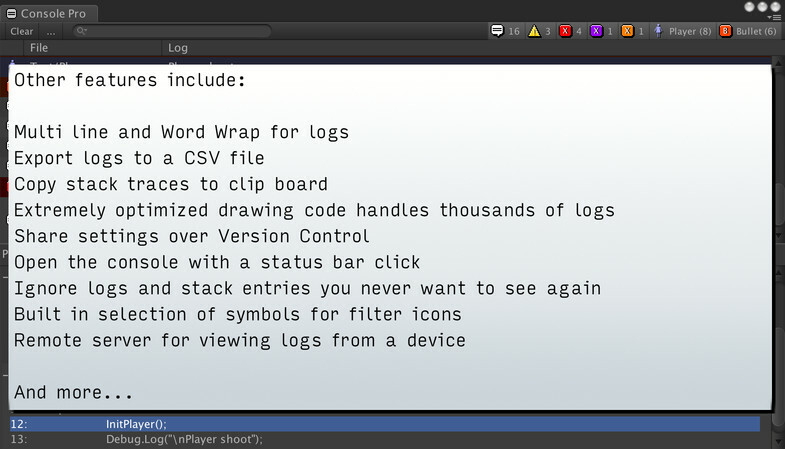 - Copy full logs and stack traces to the clipboard with one click. - Export the entire console output to a txt file, including stack traces. 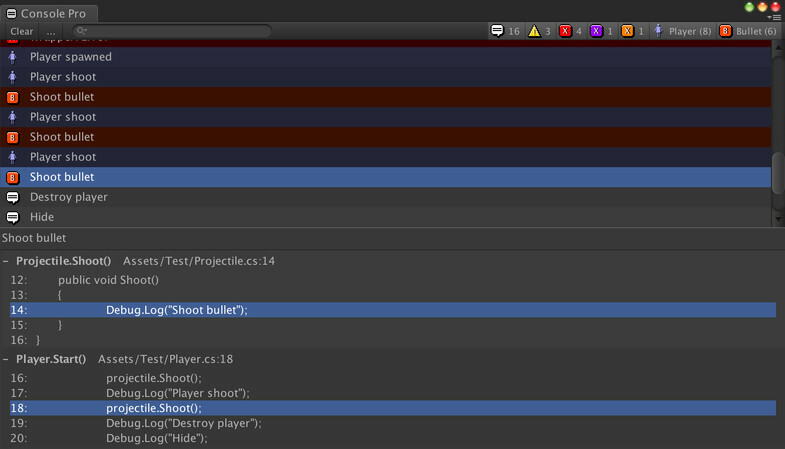 - Override Unity's status bar click.